George specialises in commercial litigation and arbitration with an emphasis on the following four areas: international commercial arbitration, financial services, construction law and professional liability claims (including disciplinary work). George is rated in Chambers and Partners and the Legal 500 for International Commercial Arbitration, Commercial Litigation, Professional Liability and Professional Disciplinary work. He is noted for his “real intellect”, being "an absolute pleasure to work with", an “up-and-coming star" who picks up the "key legal issues very quickly" and a junior who "really stands out for his commercial approach." 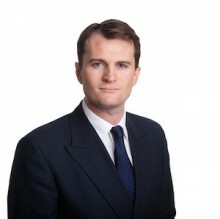 In addition, in 2012 George was named as one of ten ‘Stars of the Bar’ in a survey by Legal Week, having previously been named in the 2010 version as a ‘Highly Commended’ Junior. George is on the Executive Committee of COMBAR (the Commercial Bar Association) and was Chairman of Junior COMBAR from 2011 to 2013.